I walk quietly on barefeet through my garden, erupting with summer solstice blooms, butterflies filled to bursting with nectar. I have to expand my ribs….. lower, around the sides…to be able breathe in all this in. To really eat this beauty. I slow down, low to my knees, pursing my lips to a succulent stonecrop, kissing its tiny canoe-full of rainwater, and sipping, I drop a few tears to mingle with the dew. Picking praise, petal by petal, until I am holding a basket of blooms. Edible suns, stars and rainbows will be in a big bowl by mealtime. Yes, this is my salad. 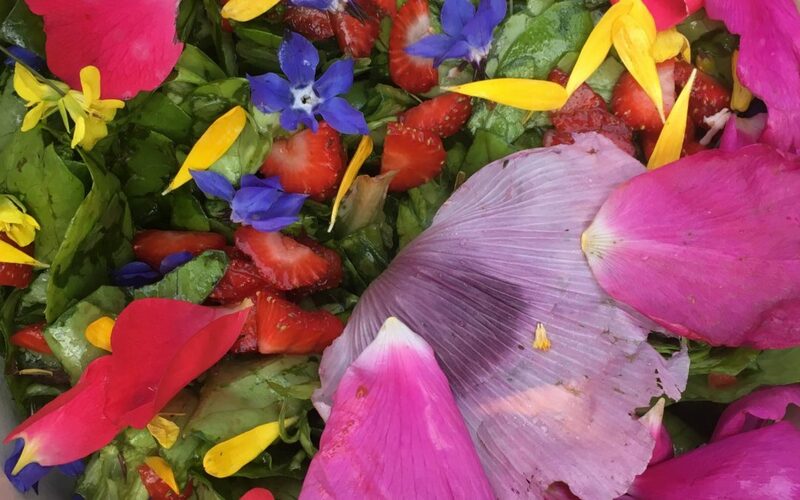 Again, I have to remind myself to go slower, to take in the good fortune of being able to literally consume this beauty–on the daily!–with a little bit of olive oil and a whole lotta gratitude as dressing. It is so gorgeous, that the bowl could easily be routed towards my altar, a delectable offering for my ancestors, who feed on beauty more than calories. I suppose, with all these garden delights on the menu, the dinner table has indeed become an shrine. I eat this beauty in honor of those who cannot. And in eating this way–in slow-food style–the food I prepare, and how I prepare it, becomes a way to feed beauty back to this inflamed world, cooling her fevered brow with roses and rainwater. It is sometimes hard to fathom that I can live a life dripping with such exquisite grace amidst a sweating society of layered crises, one folding in upon the other. That I have the privilege of picking fresh raspberries with my son while infants are right now–in the name of “zero tolerance”–being ripped from their mothers’ arms as they petition for asylum. I stop and linger with my hands cupped around this Texan-Yellow Rose, singing a prayer of moist compassion out towards this mother, and this baby. This I can do: Create a portal of dewdropped-dignity from this lucky little window, opening upon a scorching desert bridge. This much, I must do. 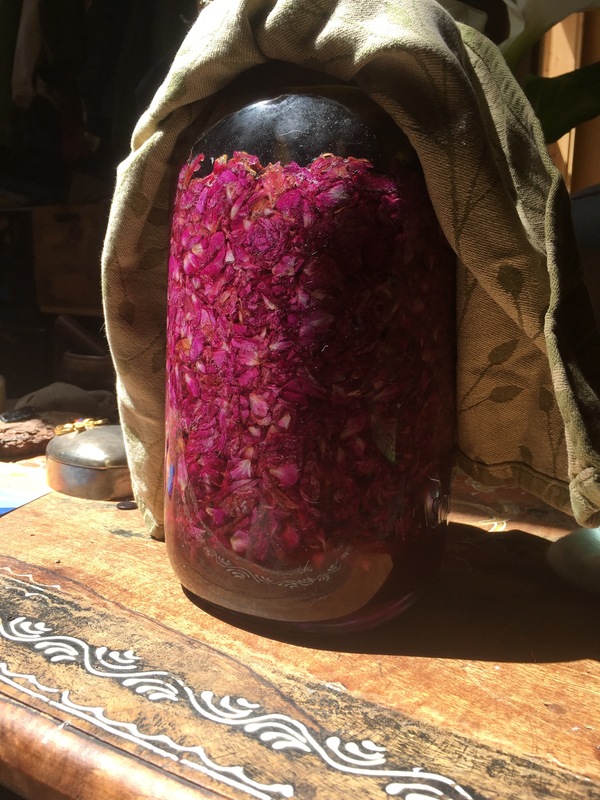 I place a gallon of roses mixed with honey on my altar for you, my dears, proof that the sweetness, and the regal beauty of roses are here in this world, too. That I can eat this way makes it all the more important to relish eating this way, on behalf of those who cannot.